Anyone that knows me knows I have a liiiiiittle obsession with all things office supplies/stationary. I can’t explain it, but I can’t get enough. I find that some people either get that completely or think I’m a weirdo but aaanywho, it’s a part of me. And I don’t know about you, but when I have the right office supplies I actually become more productive — I guess the pretty things inspire me, what can I say? 😀 I’ve recently come into some fun, beautiful and useful upgrades to my office game and wanted to share them with you guys! I have always been a planner kind of girl. I love writing things down and never really transitioned to using my phone or a Google Calendar for my full schedule because something about writing down appointments and to-dos helps me drive them into my memory more deeply. 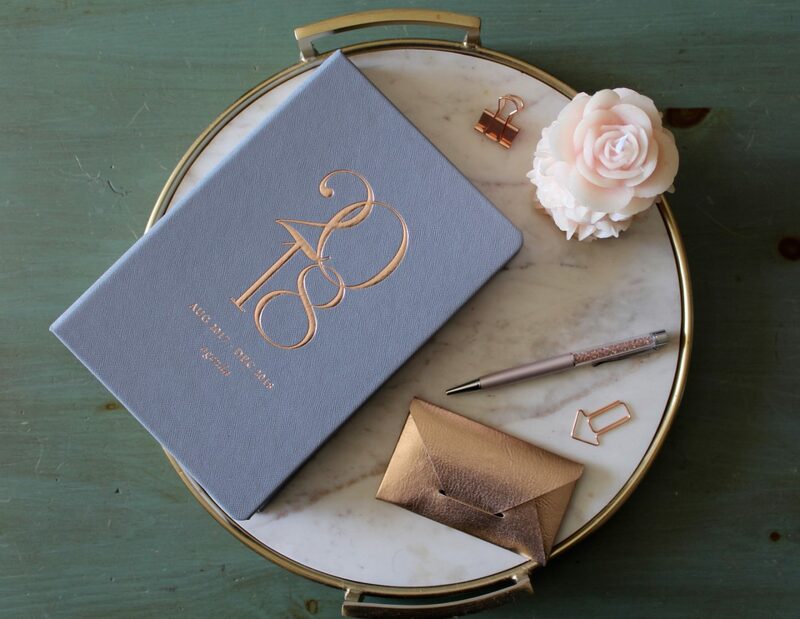 So I am always very particular about finding the absolute *perfect* planner that will live with me for a whole year. For several years, I’ve used the planners from Paperblanks, which come in a variety of sizes and styles and have stunning artwork on them (so you never get sick of admiring them 😉 ) but this year I found something different. I looove Anthropologie and found the most beautiful, simple planner there that started in August! (double win!) I was attracted to the layout of the month view, the spacious day view (I need all that space to write down daily to-dos) and the tabs on the side for easy shifting between dates. It has been working out perfectly for me and I would say that spending a little extra money (this one was $30) is well worth it when you find something that works for you and can keep you organized. For the longest time, I used this basic leather laptop sleeve that I found at HomeGoods (love HomeGoods so much) that wasn’t even really designed to fit my laptop. I started shoving loose papers in there too from work or wherever because I had no where else to keep things from getting crumbled or folded. For something I used every single day, I thought it needed a serious upgrade. I found this super cute leather folio-style case from Amazon for $20 by Kalidi and it solved all my problems. It’s even slimmer than the other one so it slides right into my bag or backpack and it’s folio-shape allows me to store papers in the side without them getting ruined. Perfect, inexpensive, and cute. Win. This is one item I never had, and never realized I was missing until recently. As you may be able to assume, I am also mildly obsessed with Paper Source. I found this little guy for $5 there and couldn’t pass it up. I was keeping my business cards and the cards of others in a side pocket of my purse for the longest time and this little inexpensive purchase solved a big problem. I now store everything in there and can always know where to find my cards in a hurry and keep them organized in my bag. No more random cards at the bottom of my backpack — woohoo! I discovered the power of a good, special pen in college when I desperately needed something to keep me interested in taking notes in class. My mom gifted me this stunning Swarovski pen and it might sound silly, but I started looking foward to using it. I think having a beautiful pen is one of those silly little things that can really brighten your day or make something small a little more fun. And the trinkets — oh, the trinkets. I am a sucker for random small things that are cute, and this extends outside of the realm of office supplies. But let’s stay focused. 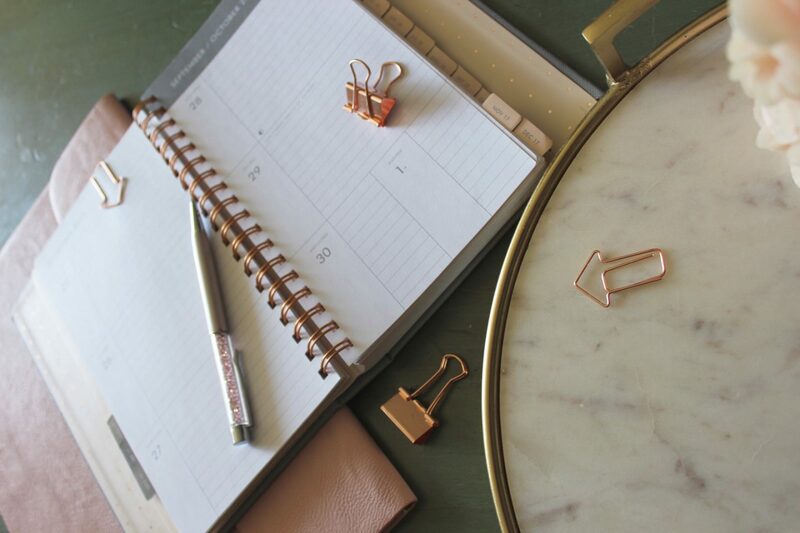 I can’t get enough of the shiny little paperclips, binder clips and magnets out there. I found these ones at Target in the dollar bins actually, ha! I use the cute shaped paper clips to hold my place in my planner. To my point earlier, the stationary lovers out there will understand me. and back to school game and get inspired for the year ahead! Is anyone out there as stationary obsessed as me? It’s a weird passion but I roll with it. Next Post Chemical-Free and Clean Cosmetics — European style! Omggg I completely understand your obsession! I love sstationary items so much, especially because I love sketching and drawing so this post was a blessing tbqh! I love your photography of the items. It delivered the message so well! And I find that having an organize space while using tools I admire DOES help me become more productive! OMG!!! It’s like we’re the same person, I LOVE THIS!!! I’m such an office supply lover too, and SO all about pens! I hand-write a thank you note any chance I get! This is a great post, thanks so much for the tips on where to find the items too! I love your photos. 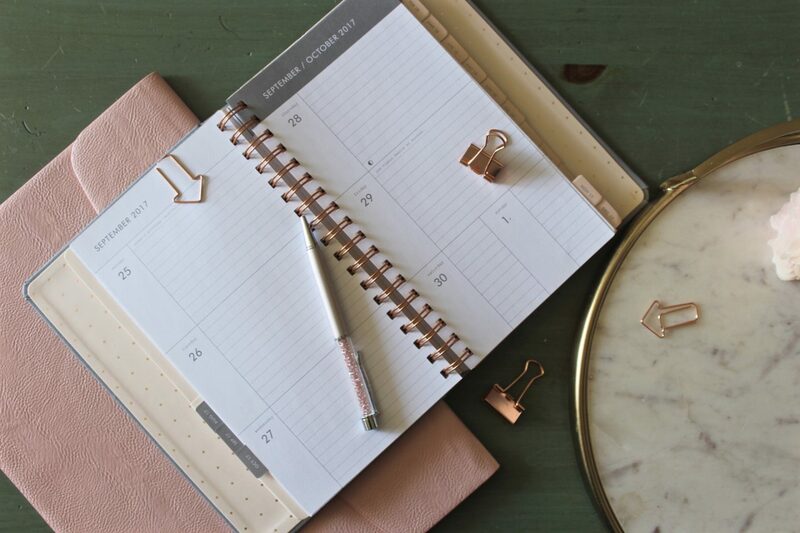 I need a more functional planner so that I use it more consistently. Absolutely agree! 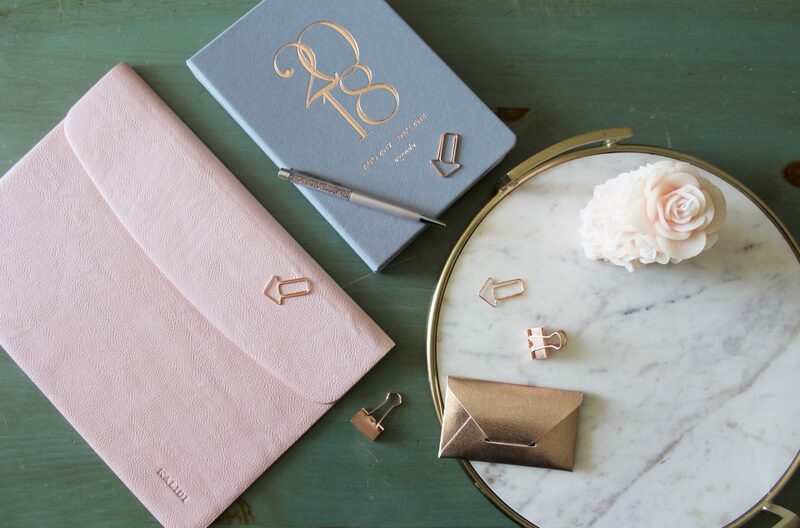 A fancy pen, pretty note pad, special post-its… these things are necessary! And you are probably right, some people out there think this stuff is mundane office supplies while those of us with a slight obsession see these things as inspiration! Loved this!!!!!! I feel your obsession with stationary, i can’t stop. Especially with planners and pens!! hahhaha yesss! I really can’t stop either. This could be a whole segment on my blog. Ha! Loved this post, your pics are so pretty. And that marble tray😍😍😍gorge! Thank you so much, lovely! The tray is from Target, it was a steal! Love this post! I so relate when it comes to being obsessed with stationary. Planners are amazing, but finding a good one can be hard sometimes because everyone wants something a little bit different out of them. Love this because that’s something I definitely need help with.